This is probably the most basic star block. But it is a classic favorite that looks good in any fabric, and is easy to re-size to make smaller or larger. You can see my full quilt top here. Or the finished quilt here. My blocks finish at 11″ (10.5″ after squaring…if you square them). 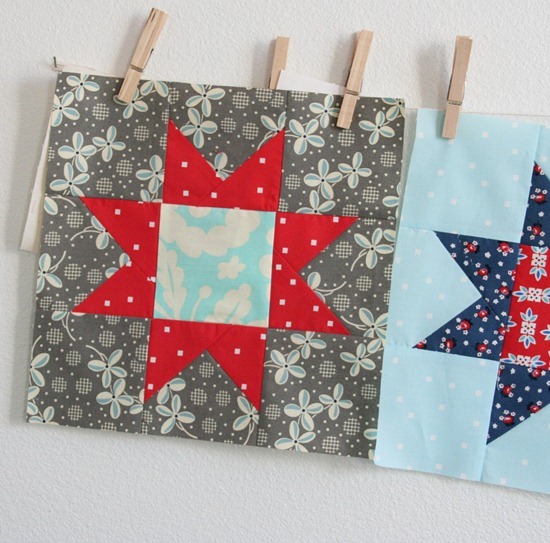 Start with 8 – 4″ background squares, 1 – 4″ center square, and 8 – 3″ squares for the star points. 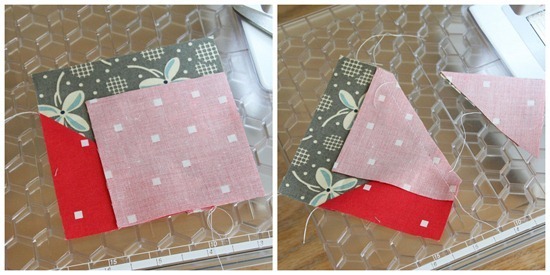 On 4 of the background squares place a 3″ square in a corner right sides together and sew from corner to corner. The tape trick comes in handy again on these blocks. Cut the corner off leaving 1/4″ and press open. Place another 3″ square in an adjacent corner and repeat the steps. Layout your squares again and sew the squares into three rows. Press the seams of each row in opposite directions, and sew the rows together. The finished block should be 11″. I squared my blocks up to 10.5″. 48 blocks (6 in each row, 8 rows) makes a perfect twin size at 60″ x 80″. Those are great…love the way they float! And no points to match at the center square and the flying geese…great block! I love the colors you used. This has always been among my favorite blocks. Good tutorial, too! Oh I just LOVE this quilt! 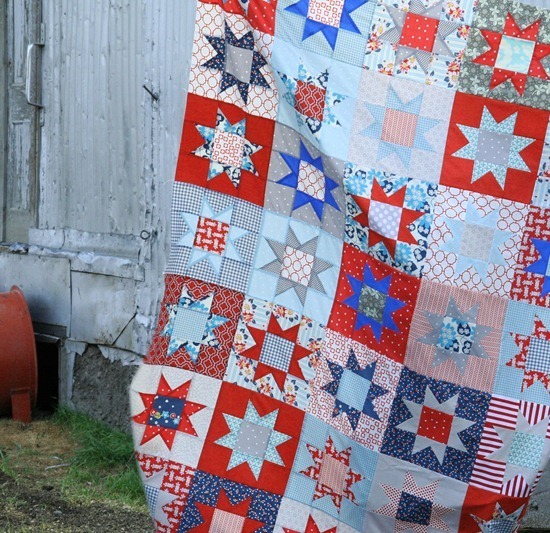 I adore that quilt – the red, gray, white, and blue are so fabulous and summery! Thanks for the tutorial. I love the way the base of the star points overlap. I hadn't given much thought about how to do this, but the way you do it is so simple. Thanks! Great tutorial! I need to make some of these, and had been wondering just how you do it!! Normally I'm not big on red, white and blue quilts or anything of the sort, but I love this. It's so fresh and pretty. Very cute! Thanks for the tute. this block never gets old! Thank you so much for posting this!!! I love this block but didn't know how to do it. You are my quilting idol as I start trying to become a quilter.I love everything you do.Thank you for sharing your talent. Al, that gray flower-y fabric is SO cute, where did you get it?! Perfect timing for this post! Thank you so much for posting. awesome tutorial!! now I just need to learn how to sew … haha! Love the colors you chose for this quilt. The pattern is perfect to show them off. Thanks for this great tutorial. I love this! Thanks for the tutorial – this quilt may just end up on my (long long long) to-make list. Thanks so much for this easy-to-follow tutorial! i love that red square fabric so much i bought myself some yesterday! hop over to my blog and check out my finished kaleidoscope. 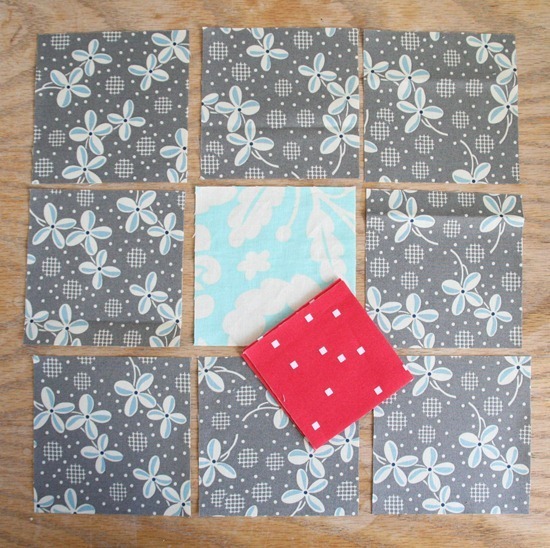 i am seriously in love and am thinking of hand quilting… am i crazy? Your quilt is beautiful. Thank you for sharing your tutorial!! I LOVE that way of making them. Will hafta do one like that for Quilts of Valor..AWESOME! Thanks for sharing!! Thank you so much for sharing this. I am so in love with this quilt!!! Thank you for continuing to share your amazing talent & giving us another easy to understand tutorial. 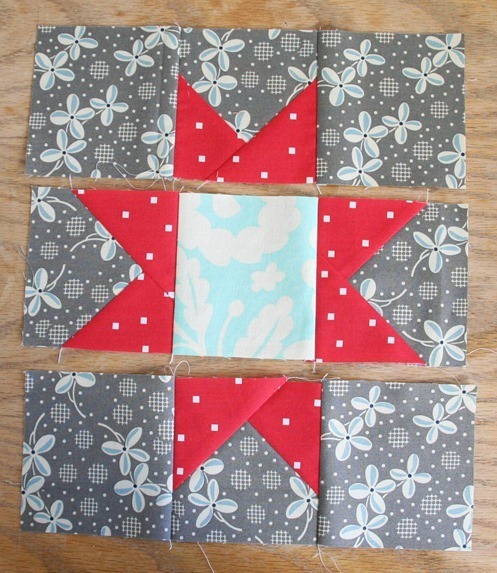 You've made it so easy to make my fav star block I know that I will get a star quilt done for this 4th now & I thank you. Happy 4th! You just rocked my world! You mean to tell me your blocks don't just automatically turn out squared??? All this time I thought I had Patchwork Deficiency Disorder (PDD)! I feel SO much better now! Wow- you are so generous with your tutorial sharing! Thanks! 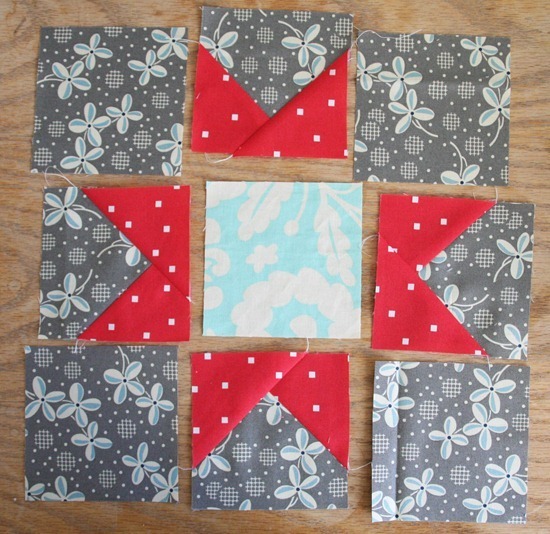 Great block/quilt….thank you for sharing the tutorial! thank you so much for the tutorial. I hope to try it out sometime. Great tutorial! This is definitely on my to-do list. I would love to see how you quilt the top when you are all done. You are magical!! I thought the stars would be much more difficult!! Thanks for showing how!! Thank you *SO MUCH* for sharing your tutorial with us!! Your quilt had me swooning and now I have made a whole row of stars for my quilt and I just love them! :o) I used all my scraps of fabric!! thanks for the tutorial for this block! i love it! i'm a 4th of july baby, so is my sis. maybe we need matching quilts like this? have I told you recently how fabulous you are? well, I shant wait another minute: you did it again! you created a wonderful quilt and shared an easy to follow tutorial, also. I share your blog addy with all my quilty friends and students. bravo! and a well wishing thank you. We hand select only the best free tutorials and patterns for the home sewist. i have see that you use a bernina ; ) i too- i'm swiss. This is a great and stunning project!! This tutorial will certainly help a lot!! Thanks!! Hi there! Love this tutorial! Such a pretty quilt. I have a question: If I wanted to resize, are the corner star pieces always one inch smaller than the background pieces? Thank you! I used this tutorial to make my first ever quilt – and my daughter loves it. Thank you so much! This was extremely helpful, and thanks so much! Thank you so much for this tutorial. I am teaching myself to sew/quilt. I made this test block today and it's very easy with your directions. I’ve been struggling with flying geese star points. Thanks for saving my sanity with your stitch and flip method. We’re your fabric choices mostly from one line? Nope this was a huge array of different fabrics! Sorry!